This is a photo of Caroline and Serge. 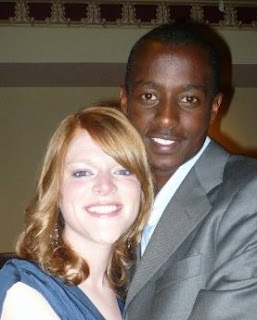 For those of you who don't know me, Serge is our "adopted" son from Rwanda. He is a student at Abilene Christian University and the runner extraordinaire that I mention in my profile. We've only known Serge for a couple of years but have adopted him into our family and into our hearts. Our girls think of him as their brother and he considers them his sisters. He calls us Mom and Dad. We are honored. Serge asked Caroline, our youngest, to carry the Rwandan flag during the special chapel at ACU at the beginning of the school year. She was so honored! Vann and I went to a cross country track meet this morning close to ACU to watch Serge run. Wow. That young man is as fast as lightning on a rainy night in Georgia. It was a four mile run, but Serge was only going to run two miles. He was trying not to tax his body too much since he is leaving for Trinidad for a race the beginning of this week. It was so exciting to see him break out of the crowd and be first, then second, then first. Something I admire so much about our son is that he always, always gives his all. When faced with hardship, he is looking for the way to make it work. He doesn't give up. Tomorrow at church there will be a video of Serge. It will be on persecution. This is a topic, unfortunately, that our son knows all about. He is a survivor of the genocide/holocaust that happened in Rwanda in 1994. He was only 6 years old. On his his seventh birthday when the Hutus were hunting for the "Tutsi cockroaches" Serge was running and hiding to save his life. Serge is a Tutsi. The first May we knew Serge we gave a birthday party for him with just our family. He was so touched. It was the first time in his life his birthday had been celebrated. Oh, the things we take for granted. I love this young man so much. I love his heart to want to serve others. I love his desire to go back to Rwanda to educate and teach people how to love and accept one another. I love his dedication to school, running and work. I love the way he loves God. I love what he teaches me by his life. What a wonderful mother you are and what a wonderful blessing your son must be to you! Serge is such an awesome young man. You are all lucky to have each other.